An introduction to the ways supermarkets fail to reduce food waste in the U.S.
Supermarkets have an enormous influence on the food system, including the environmental footprint of food waste. As the primary place where most Americans purchase food, supermarkets influence what makes it from farms to shelves, what happens to unsold food and even how much and what types of food shoppers buy. Roughly 40 percent of the food produced in the United States goes uneaten — costing more than $200 billion each year and creating unnecessary impacts on water supplies, clean air, climate and wildlife. The new report, “Checked Out: How Supermarkets Fail to Make the Grade When It Comes to Reducing Food Waste,” from the Center for Biological Diversity and the Ugly Fruit and Veg campaign, analyzes key food-waste reduction commitments, policies and actions across the top supermarket chains in the United States. Using publicly available information and details provided by company officials, we evaluated and graded 10 companies — Ahold Delhaize, Albertsons, ALDI, Costco, Kroger, Publix, Target, Trader Joe’s, Walmart and Whole Foods Market — that operate a combined total of more than 13,000 grocery stores across the country. The analysis was also applied to Tesco U.K. as an example of a major European supermarket that has adopted effective food-waste reduction policies. 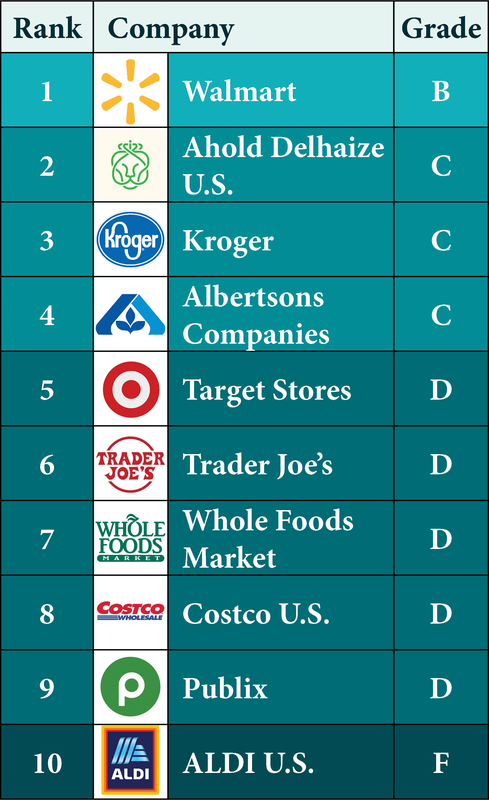 Nine out of America’s 10 biggest grocery companies fail to publicly report their total food waste. While all of the companies except Whole Foods reported on surplus food donations that limited data does not indicate the scope of the food-waste problem or what steps the stores are taking to prevent it. Food waste has enormous environmental, social and economic costs. Because of the size and scope of the problem, demand is growing in local, national and international circles to address the issue. Both the United Nations and the U.S. Environmental Protection Agency have announced goals to halve food waste by 2030. Retailers account for more waste than restaurants or food-service providers. Yet the supermarket industry has taken little meaningful action and made few public commitments to tackle the problem. Although all the large grocery retailers in the United States have programs to donate surplus food, we found that the sector as a whole is doing very little to prevent food waste from the start. With few exceptions they have failed to take even the first step toward accountability by committing to address food waste and tracking their food waste to understand better how it can be reduced. Companies were scored with points given in eight different areas: corporate transparency (tracking and publicly reported data), company commitments, supply chain initiatives, produce initiatives, shopping support, donation programs, animal feed programs and recycling programs. The four companies that earned a C grade or higher were the only ones with specific food-waste reduction commitments. Kroger leads the way with a commitment of zero food waste by 2025. Four of the 10 companies have no imperfect-produce initiatives, which can prevent the waste of imperfect fruits and vegetables. Walmart was the only company with a variety of clear in-store efforts to reduce food waste, such as improving store fixtures, standardizing date labels and educating associates and shoppers. All of the companies have food-donation programs, with the majority operating company-wide. ALDI was the only company that did not report a food-recycling program (e.g. composting, animal feed or other industrial uses). To help meet national and international food-waste reduction goals, corporate sustainability targets, and to do their part to reduce wasted food, we call on U.S. supermarkets to commit to eliminating food waste by 2025. To meet that goal, they must take concrete steps to reduce food waste in their supply chains and their stores and provide transparent public reporting on their progress as outlined in this report. 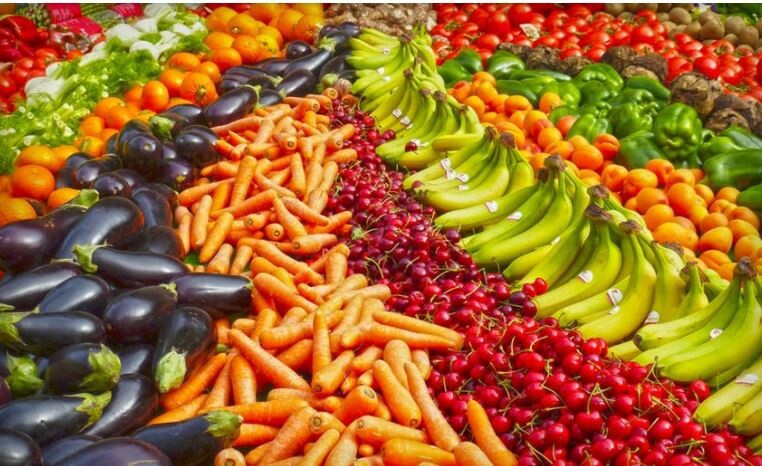 Eliminating food waste in the grocery sector could have a ripple effect across society that could help address hunger, save money, conserve water and land, create more efficient agricultural systems, reduce greenhouse gas emissions and protect endangered species. Customers have taken notice of the massive problem of wasted food in the United States and want responsible businesses to take action. From Checked Out: How U.S. Supermarkets Fail to Make the Grade in Reducing Food Waste, a report from the Center for Biological Diversity and the ‘Ugly’ Fruit & Veg Campaign.